Which Eclipse files is it appropriate to put under source control, aside from the sources obviously? If there are any of these for which it depends, please explain your guidelines. Metadata should not be managed in source control. They contain mostly data relevant to your workspace. The only exception is the .launch XML files (launcher definition). And they should be copied into your project directory: When your project is refreshed, those configurations will be displayed in the "Run configuration" dialog. That way, those launch parameter files can be also managed into the SCM. should be in your SCM (especially .project and .classpath according to the Eclipse documentation). 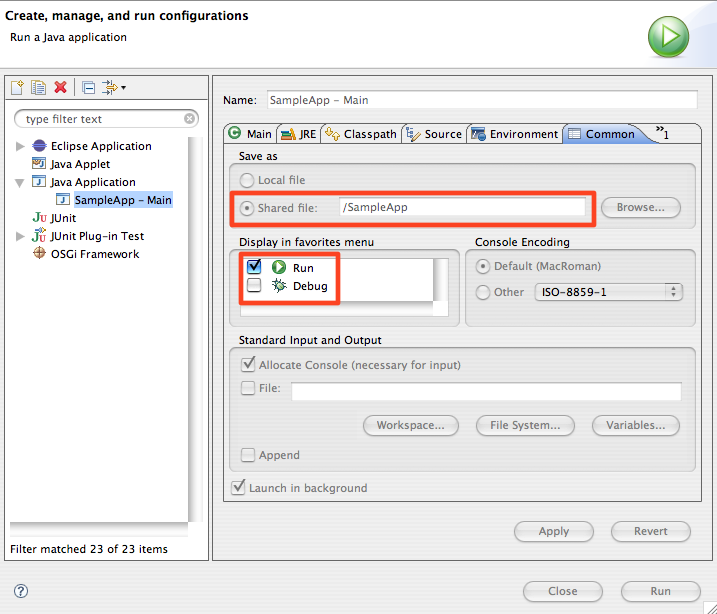 The goal is that anyone can checkout/update his/her SCM workspace and import the Eclipse project into the Eclipse workspace. For that, you want to use only relative paths in your .classpath, using linked resources. Note: it is better if project-dir refers to an "external" project directory, not a directory created under the eclipse workspace. That way, the two notions (eclipse workspace vs. SCM workspace) are clearly separated. As ipsquiggle mentions in the comment, and as I have alluded to in an old answer, you can actually save the launching configuration as shared file directly in your project directory. All launching configuration can then be versioned like the other project files. I am currently working on a project where we have the .project and .cproject files under source control. The idea was that settings related to library paths and link directives would propagate across the team. In practice it hasn't worked very well, merges almost always come back in a conflicted state which need to be deconflicted outside of eclipse and then the project closed and reopened for the changes to take effect. I wouldn't recommend keeping them in source control. It's worth nothing that CDT configuration files are not source-control-friendly. There's a bug filed for .cproject files changing very frequently and causing conflicts, see Sharing cdt-project files in repository always causes conflicts. Some projects, like those using Maven, like to generate the .project files based on POMs. That said, other than that - .metadata should NOT be in source control. Your project will have to make a determination about whether projectdir/.settings does, based on how you plan to manage standards and such. If you can honestly trust your developers to set up their environment based on the standard, and you don't have to customize anything special for any project, then you don't need to put them in. Me, I recommend configuring every project specifically. This allows devs to work on multiple projects' stuff in the same workspace without having to change default settings back and forth, and it makes the settings very explicit, overriding whatever their default settings are to match the project's standards. Only difficult part is making sure they all stay in sync. But in most cases you can copy the .settings files from project to project. If there are any you specifically don't want in source control, do the equivalent of setting svn:ignore for them, if your SCM supports it. The .classpath file is definitively a good candidate for checking into scm as setting it by hand can be a lot of work and will be difficult for new devs getting into the project. It is true it can be generated from other sources, in which case you would check in the other source. As for .settings, it depends on the settings. This is a grey area, but some settings are almost mandatory and it is convenient to be able to check out a project, import it in Eclipse and have everything set up and good to go. At our project, we therefore maintain a copy of the .settings folder called CVS.settings and we have an ant task to copy it to .settings. When you get the project from CVS, you call the 'eclipsify' ant task to copy the default settings to the new .settings folder. When you configure settings that are needed by everyone developing on the project, you merge those back into the CVS.settings folder and commit that to CVS. This way saving settings in SCM becomes a conscious process. It does require devs to merge those settings back into their .settings folders from time to time when big changes are checked in. But it's a simple system that works surprisingly well. I'd say none of them. They most likely contain information that is relevant only to your workstation (I'm thinking about paths for libraries and all). Also what if someone in your team is not using Eclipse? These SHOULD be in version control as long as you stick to using project-relative paths. This allows other developers to check out the project and start working right away without having to go through all the setup pain that other developers went through as well. You might be tempted to include .metadata in version control as well so Eclipse developers can check out an entire workspace and have it preconfigured with all the right projects, but it includes a lot of user specific information that anytime anybody works on it, it will change, so I would advise to NOT INCLUDE .metadata. It's easy to build a local workspace just by importing all existing Eclipse projects. I have spent too many hours configuring eclipse workspace settings for new colleagues (and myself). What I ended up doing eventually was copying my own .metadata to the new developer machine. Not the answer you're looking for? Browse other questions tagged eclipse version-control svn or ask your own question. Should I check-in the eclipse settings (.settings) to SVN? How to share Eclipse workspace and project settings across a team? Should I keep my project files under version control? .classpath and .project - check into version control or not? Is it acceptable/good to store binaries in SVN? which eclipse project/workspace files should be added to source control? What to put under version control?